Grilling outdoor is not an option anymore for the last couple of weeks. It is getting cooler and occasionally raining here. You can still enjoy the tacos with a pan cooked meat and some spicy salsa. Chipotle burritos are our favorite take-out food, which allows you to control the fat content by choosing your own fillings. I make these tacos which are almost close to the ones you get from the store. 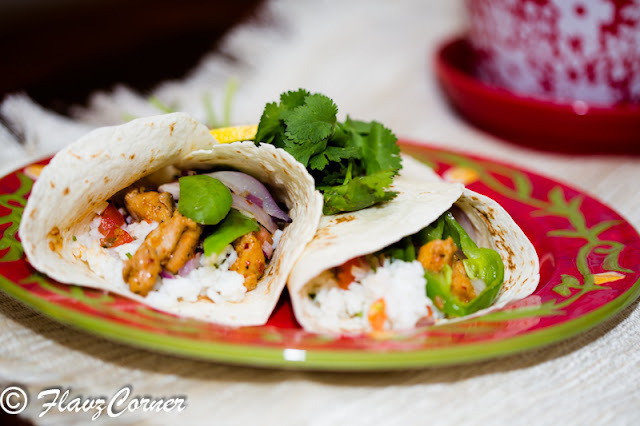 These tacos are really easy to make and if you plan it a day ahead, it is something that could be fixed within 30 minutes. I usually clean and cube the chicken ahead and freeze it, which saves me lot of time especially when I am lazy after work to make an extensive dinner. Cook instant rice according to the package direction and mix the oil lemon juice and chopped Cilantro. Mix the chopped onions, tomatoes, Jalapeno peppers, Cilantro and salt to make the salsa. Light grease a non-stick pan with cooking spray or 1 tsp of oil and add the onions and green pepper with salt and saute for 3-4 minutes over medium to high heat till it the onions are translucent. Remove from heat and transfer the onion and pepper to a bowl. Add 1 tsp of oil to the same pan and cook the garlic till golden brown. Add the chicken and the rest of the ingredients for Chipotle chicken, cover and cook till the chicken is well done and still juicy. Warm the tacos one by one on a hot griddle or a non-stick pan, by flipping both sides. 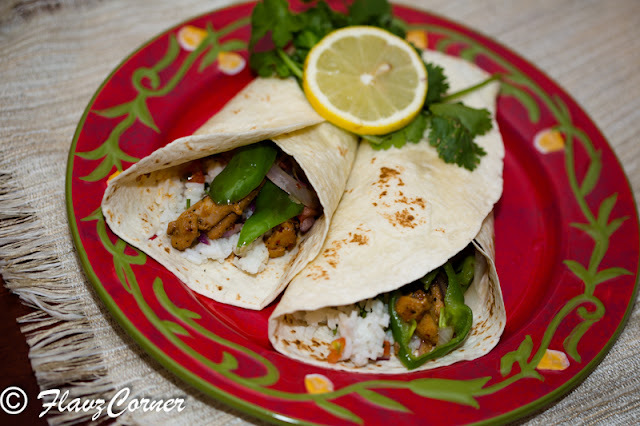 Fix the tacos by adding the fillings including chicken, rice, salsa and sauteed onions and peppers. Garnish with the cheese and add some sour cream on top of it and enjoy. Adjust the Jalapeno and Chipotle pepper according to your taste. Thanks Shema for the comment!!! Check for the Grill Mates Chipotle Pepper Marinade (1.13 oz) packet on the McCormick section on any grocery store. I've always wanted to try making homemade taco's like these...Looks simply superb and I'm all hungry now! Try it on the weekend when you have some time to get all the ingredients together. You will definitely get hooked to it.